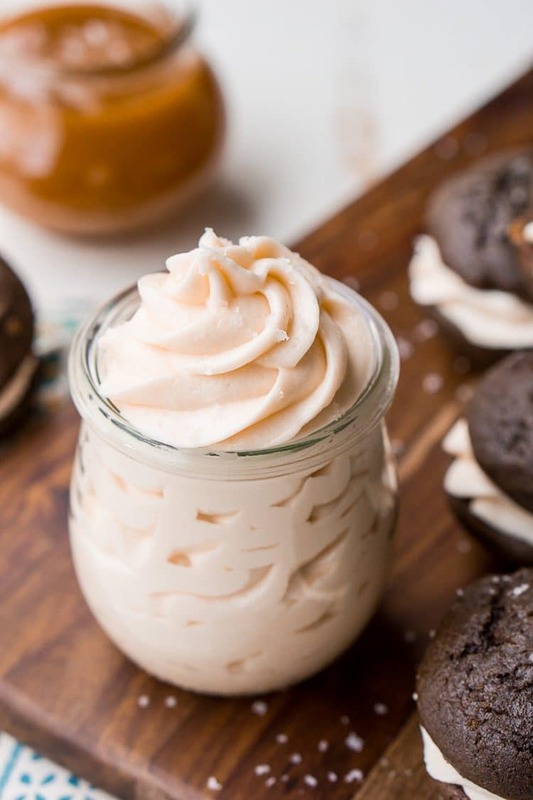 Salted Caramel Frosting is a delicious buttercream recipe for cakes, cupcakes, whoopie pies and more! I do actually adore my Salted Caramel Carrot Cake, it’s pretty darn epic, and has become an Easter tradition. Matt loves salted caramel, it usually his first choice of gelato and fudge, except maybe peanut butter, but I feel like that’s kind of a given, amirite? 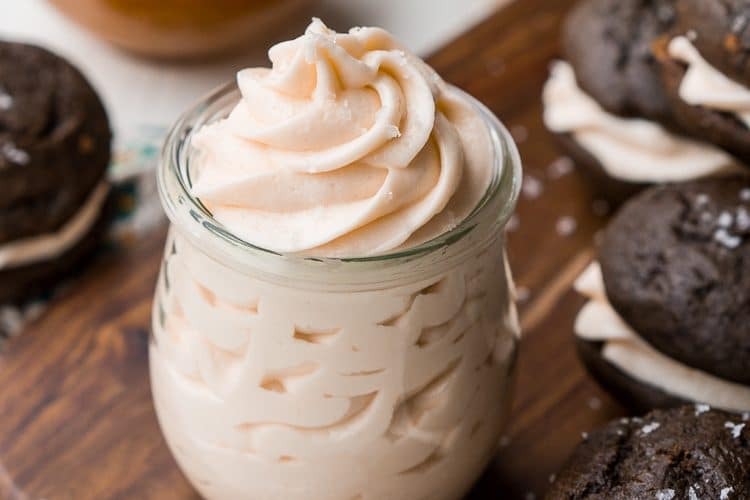 Like most of my frosting recipes, this Salted Caramel Frosting is whipped into a creamy buttercream made with butter, powdered sugar, heavy cream. 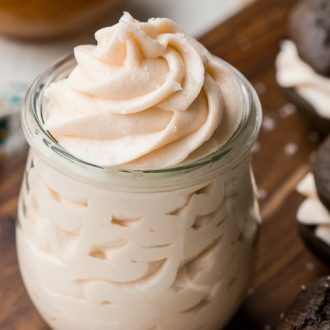 The caramel sauce and Fleur de sel add the final touch to this decadent frosting you’ll want to slather on EVERYTHING! Cakes – because every cake needs frosting! Okay, not every cake, but it never hurts! 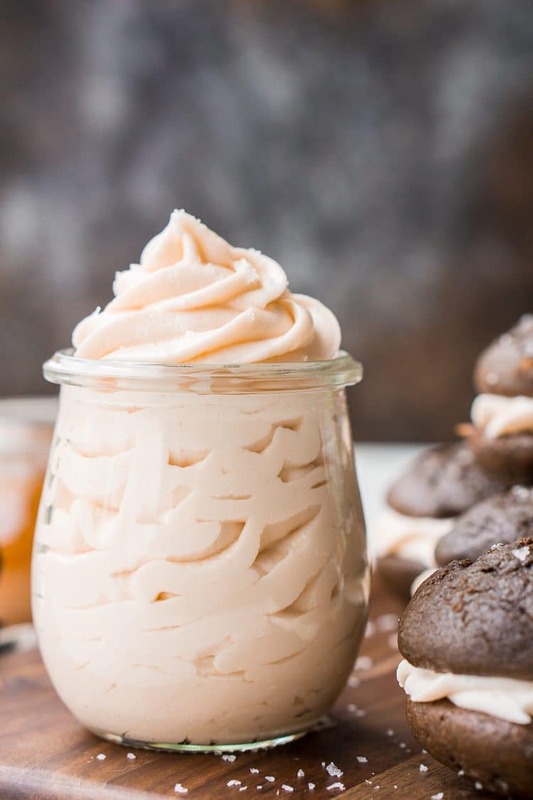 Whoopie Pies – The Maine State Treat! 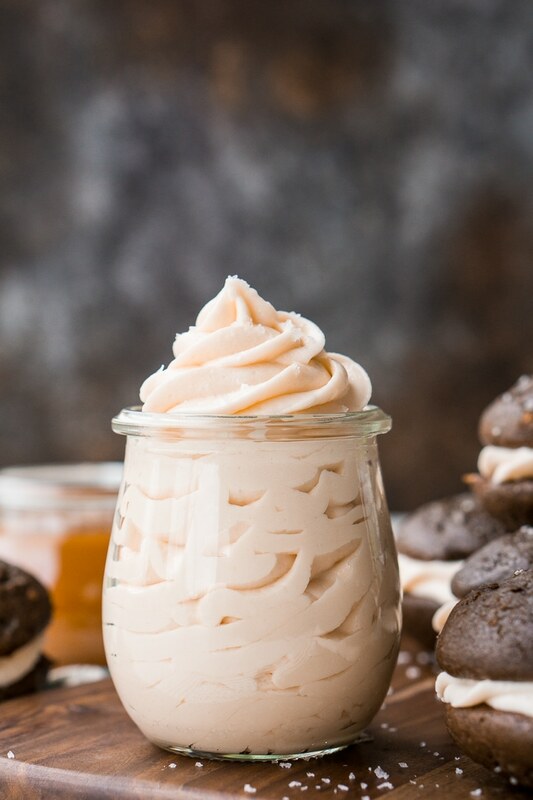 This frosting would make an excellent filling for chocolate whoopies! Cookies – Either as a light spread of as a cookie sandwich filling! Freakshakes – If you’re ever up to making one at home, this would be great around the rim! In a large bowl or stand mixer fitted with a paddle attachment, beat the butter until smooth. Add in the confectioners' sugar a little at a time, mixing between additions. Add in the caramel sauce, vanilla, and Fleur de sol and beat on high for 2 minutes. Add in the heavy cream and beat on high for another 4 minutes until light and fluffy. This frosting looks so perfect! I love the flavor of salted caramel! Does this frosting have to be refrigerated? Hi Rashidah, it doesn’t have to be but it can be. Just be sure to keep it in an area that doesn’t get too hot. Thanks, Rebecca! I want to use this frosting with the butterbeer cupcake recipe and I won’t have space in my fridge for them.